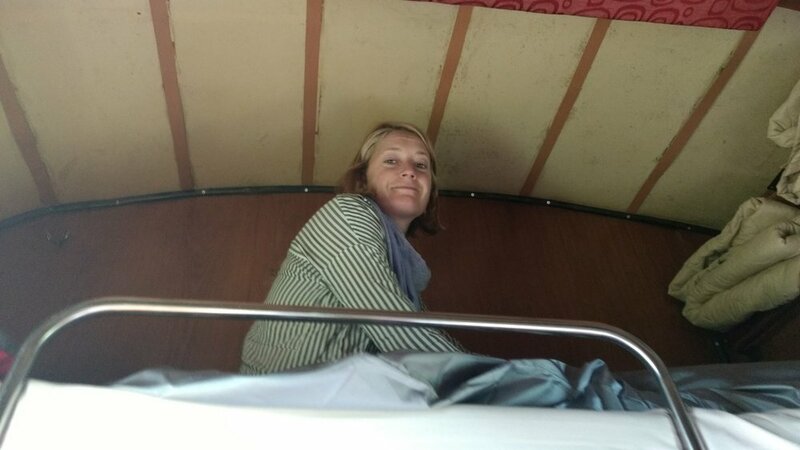 We were excited by the romantic idea of riding the overnight train to Hoi An. The train was from another era as we had imagined, so stepping aboard felt like stepping back in time. I had booked a 4 berth which was beautifully wood paneled and retrofitted with excellent air conditioning, but we did get a bit of a surprise, because when we entered the car there were already 4 people in it. On one bottom bunk was a man with his small son on the other bottom bunk was a man who was returning from Ho Chi Minh City after having his application for a visa to America denied (he was less than thrilled to see Americans). The third man was a relative of the visa applicant who was just there to console him, but was actually booked in a different berth. He was nice enough to climb down from my bed and join his uncle on the bottom bunk. Ali and I introduced ourselves and climbed up to our top bunks with less than optimal head room (I like the top bunk, but Ali could not understand why I had not booked bottom bunks where you have room to hang out...she is right about this). We got comfortable with our cabin mates and when the father had his son pee into a bottle on the bottom bunk we decided it was time to go to bed. In the four berth sleeper car. Hoi An is a beautiful place, so it is understandable that it is a favored tourist destination. You can see the charm in the photo below. We adjusted our expectations to this new environment of streets crowded with people and enjoyed leisurely exploration of the area on foot. All the buildings and shops have been altered to sell trinkets, tailor clothes and serve food to tourists, but the architecture shines through. One still senses the history and the fact that Hoi An was a hub of trade. In the early days from the 7th-10th century the Cham people that dominated this part of Vietnam occupied Hoi An (this is the same Islam practicing ethnic group that we would later see depicted on the walls of the Bayon temple in Cambodia being fought by Jayavarman's armies). A central feature of Hoi An is the Japanese Bridge with a Buddhist temple originally constructed in the 1590's, which connected the Chinese and Japanese quarters back when the Chinese, Japanese and other maritime trading groups began to exert influence in the city. Hoi An has a very old world cosmopolitan feel for a city of 120,000 people. On our second day a tsunami hit the coast of Vietnam so we kind of stuck to cafe's or markets and doing things like getting a shave. Ali found this great cafe called, Reaching Out, which is run by the hearing impaired so it is nice and quiet because you have to use sign language and gestures to order. We also visited their shop where they produce beautiful textiles and other products (Ali got a nice pair of new pants). Hoi An is probably most popularly known for the lanterns at night and there was plenty of that. Maybe it is the gratuitous decoration or the period architecture, but you do get a sense of being in bustling trading center from centuries ago. We enjoyed strolling the streets with the tourist throngs and went so far as to book massages during our down day waiting out the storm. Cao lầu differs from typical Vietnamese noodle dishes because it has no soup. In Vietnamese, locals call it a "mixing dish" because it includes vegetables, fried lard and sauce on top of the noodles. The ingredients are placed in the dish, but it's the customer who mixes them together. Cao lầu is therefore a special variety of noodle dish. It is also different from Quang noodle, another Vietnamese noodle dish, because of the amount of sauce, the additional ingredients, and the type of noodles used. To make Cao lầu noodles, the rice has to be stone ground and mixed with ash and water. The ash is made with firewood from the Cham Islands, around 19 km from Hội An. The noodles are cut and then cooked three times with firewood. The water to cook the noodles is also very special because it only comes from specific wells in Hội An. This is why Cao lầu is a dish that can only be prepared in Hội An. Cao lầu combines various flavors (sour, pungent, bitter, astringent and sweet) in the vegetables, soy sauce and fried lard. Cao lầu is served at room temperature.